If you think inflation isn't here, just look around. At a hardware store this weekend, I bought some 1 1/4 inch, #8 sheet metal screws for 55 cents each. The big home improvement retailers aren't much cheaper. There you get three or four in a bag for 99 cents or $1.18 depending on the store. The smaller the item, the more you get. Used to be, you could buy a whole box for a couple bucks. Old timers will remember going to hardware stores and buying by the pound for under a dollar. Nails, bolts, washers are also getting pricey. Used to be, I'd spring for a whole box of common hardware items if I thought I'd eventually use them. But now that boxes range from over five dollars and up, I hesitate before making that plunge. #12 brass washers now sell for two for $1.18 at Lowe's. In a pinch, it would be much cheaper to start drilling holes in pennies, nickels and dimes, and substitute them for store-bought washers. No more gov't stimulus to hide the ugly truth. Local governments that depend on property taxes are in a world of hurt. Property values keep falling. And a bottom is apparently nowhere in sight. "Property values in DeKalb County are falling even faster than previously believed. New statistics delivered to county commissioners show the tax digest fell by a whopping 13.4 percent, almost 2 percent higher than originally estimated just last week." DeKalb seems a little slow in figuring out it has simply run out of road after years of barreling forward by spending beyond its means using an artificially inflated housing bubble digest. And raising taxes now to cover the gap would compound the error. County officials need to look at how much DeKalb real estate is vacant and abandoned. Nobody wants it. Jacking up taxes on the remaining property owners will simply send another chill through the local market. A caller popped a question about Sarah Palin's apparent move toward entry into the GOP's presidential field at about 84:30 into the time-line of last night's Don and Doug show. It's available to listen to here. Just click the play button, let the program load, then click the player forward to the Palin section if you like. Sarah Palin is a strong voice for conservative Republicans. She was an early, out front voice for conservatives when national party leaders overlooked those who would later become known as elements of the Tea Party. But while she shines as an activist, can Palin translate her popularity into a 2012 candidacy? In some ways, she seems so "2008" when placed among the field of those already running or others rumored to by eyeing a run. And we ask what damage may have been done after years of attacks on Palin by the left. Can she successfully reach out to independent voters? Or is she the one candidate ready to deal with the socialist-leaing Democrats head on? I think we give a balanced discussion of Palin's apparent move towards entry in the race. We planned on discussing the potential Palin candidacy as part of the show, but we're glad a caller brought it up a little sooner than we had it in the rundown. Looking at the on-going foreclosure situation leads us to believe economy recovery has eluded many sectors. Meanwhile, some sectors that have touted recovery have only accomplished it with artificial government support. We also took a look at what's reported as President Obama's "under the radar" effort towards more gun control. Other past Don and Doug programs are available at the TalkSouthRadio.com website on the archive section of the Program Schedule page. Obama tried to upstage Netanyahu, but it backfired. Obama said to be quietly working on gun control. Is the GOP really in trouble after the NY 26 defeat? And what are your thoughts on Obama's 2008 gaff? Karl Denninger expands on what I have often called the Potemkin recovery. "The only reason we have not recognized an economic Depression is because of utterly unsustainable government borrowing and spending of money it does not have and which it has no hope or intent to ever take in via taxes in the future. "In other words, the Government has been lying to you. "There has been no economic recovery and we are in an economic Depression right now and have been since 2008." A drive I took yesterday east of Atlanta struck me as providing anecdotal evidence that recovery eludes us. After changing some belts, hoses and an alternator (Yes, I had help. 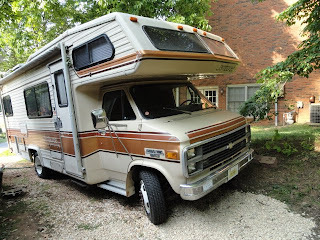 No, I didn't take it to a shop), I took a recently acquired 27-year-old RV on road test out I-20 to Morgan County. Dumped the waste tanks at a roadside rest area station - and headed back home by some back roads. Lots of storefronts empty in small town Social Circle and in other places I passed. I saw "ministry" now operates in what appears to be a of former commercial site in Monroe where mills once thrived. Other "ministries" and churches dot the landscape in buildings that formerly housed retail and other commercial enterprises. I don't recall seeing ANY new construction underway on my 50 mile back roads trek home. It looked like one of the pawn shops (I saw more pawn shops than I recalled being there) in Monroe has expanded since the last time I stopped there. They've added an indoor gun range. The parking lot only had one entrance, and was too small for me to turn the RV beast around, so I didn't stop. With my mix of rural, suburban and Interstate highway driving, it appears I averaged about 10 mpg in the RV. I'm hoping a set of new spark plugs will bump things up a little bit. The plugs, like much of the stuff under the hood, appear be original. David Gregory on Meet the Press suggested comments by Newt Gingrich at the Georgia GOP convention concerning President Obama were loaded with race-tinged code. "C'mon David. That's bizarre. This kind of automatic reference to racism." The death of Osama bin Laden is a long-sought victory. But this is just one event in a very long war. And one that may very well bring attempts at retaliation. I suspect U.S. embassies are already on heightened alert. There are other possible targets. Resupply to our troops in Afghanistan through Pakistan may top the list. Al Qaeda and its sympathizers on the Arabian Peninsula may also decide it's time to seriously target oil assets. I would not want to be living in the Kenyan village with Obama's relatives at this time. I could go on to make a very long list. Suffice it to say, bin Laden is dead, but the danger has not passed. May God protect us as we move forward. Prior to last week's show, Molly Cat held a sit-in in the radio studio. There was defiance in her eyes. We've raised her from a kitten. Where did we go wrong?